Great and affordable 0 degree bag. Comes with a built in hood to keep your noggin warm. I am a hammock camper. I use a Clark NX-250. My mindset for gear when I pack is more packability and versatility than being one of these ultra light campers. I like to camp in early spring, fall, winter. I had been researching numerous cold weather bags when I stumbled upon this bad boy. From reading the reviews most stated what I was looking for... PACKABILITY! Most cold weather bags are so big when stuff sacked that you cannot fit them into most packs. I did not want my bag being strapped to the back of my pack in wintery conditions so looked long and hard for one that might meet my criteria that was WARM , PACKABLE, and if able to be fairly light. This bag fits the bill on everything. I just used it up in the Sawtooth Mountain range in central Idaho back in the bush country. What a great bag! First night temps got down to about 28-32 degrees. This bag kept my core body very warm. I did not utilize the hood system on the first night but oh boy what a difference it made on the second night. One great thing I discovered also about this bag is its ability to wick moisture away. I am one of those cocoon sleepers. I like to put the bag over my head a bit when I sleep. In the past in cold conditions I would wake up with a soaked bag like I pee'd myself or something! In cold temps when you breathe inside your bag it builds condensation constantly. I did not notice this drawback hardly at all with this bag. Great packability - Fits into my Kelty Coyote no problem. Footbox felt very small to me and I am only 5'9". I picked mine up on Sunnysports for $155 I think? You can get the 2011 model on clearance there for 115 or so if they still have them in stock. 2012 versions dimensions were a bit bigger so took that model. I want to read a review on your Clark nx-250. I have a buddy with a Tropical, that I drool over. When I finally undertake my AT thru-trip, I hope to be carrying the North American. Great bag, comfortable, keeps you warm and dry in exceptionally wet conditions. I used for three weeks treking in Northern Nepal at about 8-14000', temps down to mid teens at night. It rained or snowed daily.....a lot. The bag was great. 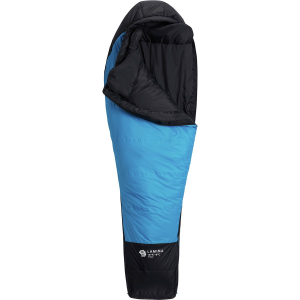 NO problems at all, comfortable, warm, and packable. Never felt damp or less than comfortable. It's been a great bag for me in nasty conditions. I just put a bid on one. I asked $70 for it with fingers crossed after reading your review. I had the Lamina 20 and sold it. Sellers remorse! I have the 2012 version of this bag. I have used it camping 3 times this winter. This bag is pretty warm. I haven't tested it down to 0 degrees, but I have been warm at around 10-15 degrees. It is comfortable and I have not noticed any cold spots, even when I roll onto my side to sleep. I have read about people having zipper problems, but I haven't had any yet. 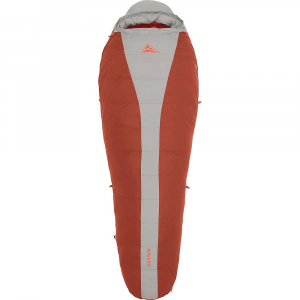 The insulation is really soft and lofty for synthetic and packs down pretty small also. I bought this on sale for $130 and feel like it was a really good deal. Overall this bag performed well on my first winter outing in some real heavy conditions. Stayed warm in blizzard conditions in Maine coupled with second night sub zero temp and high wind chill factors. Moisture inside a bivy sac did not have much of an effect. This bag performed extremely well on its first time out in some extreme conditions. The fit was great and getting in and out of the bag was not too difficult. 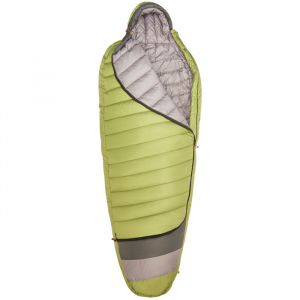 While moisture inside the bivy sac was not much of an issue it had no impact on the performance of the bag. The bonus is the compactness of this bag pack and unpacks really well. The test of time will tell about the durability of this bag. The only downfall is the zipper, I have yet to find a a company which can make a zipper one can use while in the bag without snagging. Overall this is a well designed warm bag. I have used this bag on several trips through the winter months while sleeping in lean-to's and tents. I will say this it is a very nice bag, also it's lighter weight than most synthetic sleeping bags. I haven't experienced any cold spots. It kept me very warm in subzero temps as I am a cold sleeper. It's very spacious inside the bag as I like to be able to move around a bit it has the perfect size foot box so you are not trying to keep a large area warm. It dries quickly when it gets damp. The zippers are strong, durable and don't catch the bag when you are zipping or unzipping it very much. Feel it is made with quality and durability in mind while still staying light weight. Mountain Hardware is a USA based company so for me that is another plus as well. 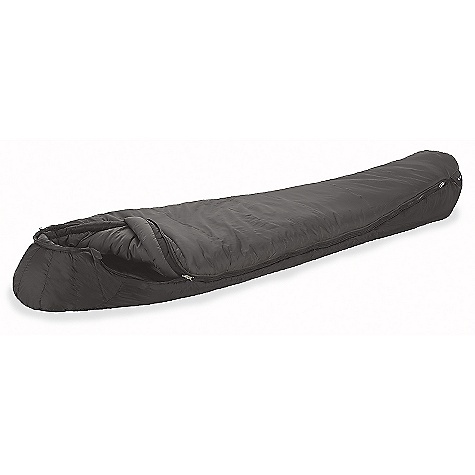 The bag is made with several small loops out side so you can attach it to your sleeping pad or hang it up to dry and it has several loops so you can turn it inside out to hang it to dry horizontally or vertically I see no real drawbacks to this sleeping bag for me. I would definitely recommend this sleeping bag to a friend. Bought this bag before a month long trip to Argentina. Bought this bag before a month long trip to Argentina. It was used in the Precordillera and Andes Mts. during the winter at up to 3600m elevation. Bag was extremely toasty even when temperatures reached well below freezing. Bag is roomy and durable, yet compress into a very manageable size. I chose this bag because it compressed nearly as much as a Primaloft bag but had a -15 rating, something which you will be hard pressed to find with Primaloft. Bag is a little on the heavy side (I own the long model) but it is within a pound of most other comparable bags. I have also used this bag camping in Maine during the fall, and despite much warmer temperatures, the bags versatile zippers allowed for plenty of venting options. Best features were the double zippers that allowed you to open up the footbox for ventilation. Two complaints: the velcro tab that closes over the zipper near your face (to keep the bag from unzipping) over time will rip up the nylon shell of the bag; and the collar is a weird overlapping two-piece setup that I didn't prefer to normal draft collars. It didn't seem to stay put as well. The stuff sack is awesome, though: three straps, one with a quick-release buckle, are much easier to deal with than the four non-releasing straps usually found on compression sacks. I was given this bag to use on a 14day NOLS trip. I was given this bag to use on a 14day NOLS trip. It was the foot box was very comfortable and had just the right amount of room but not wasting space. I was never clamy on damp mornings. Does everything they say it does. 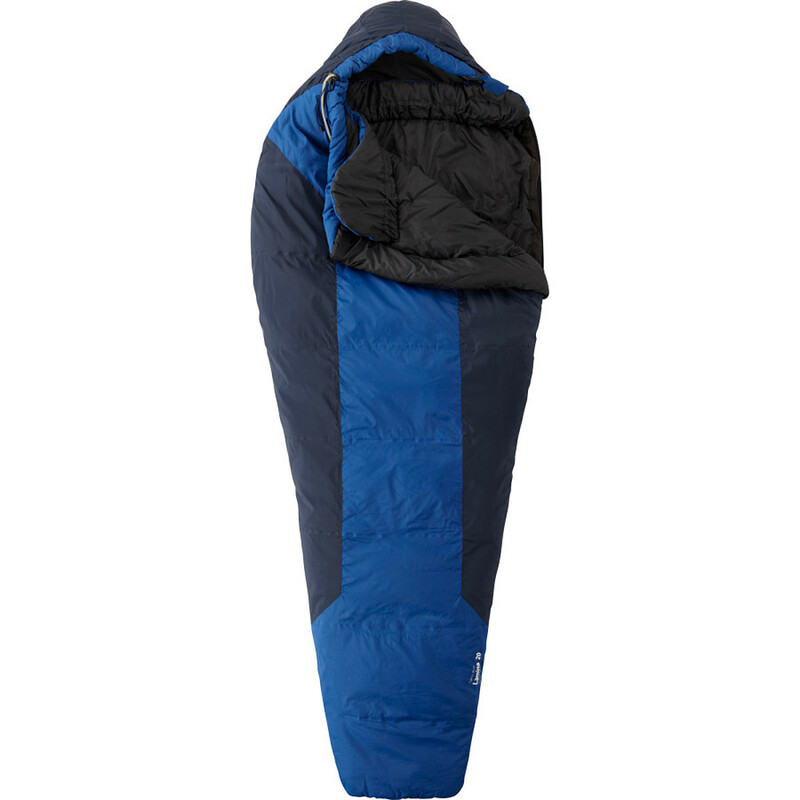 This sleeping bag keeps me toasty warm on the coldest days in the mountains. Although it is a big bag and can feel pretty heavy, a great night's sleep is completely worth it. I am pretty big guy and this bag allows be the room I need without sacrificing warmth. I've taken this bag up Mt. Adams and on several winter camping trips. The synthetic fill assures me that I'll remain warm even if I get wet in the Pacific Northwest. I highly recommend getting this bag if you're not too concerned with weight and definitely want to be warm when you sleep.